Cartilage loss is one of the main reasons why we start experiencing pain and inflammation in the joints, as we age. Certain ingredients, like glucosamine and chondroitin were clinically tested and found to be very effective in treating all the symptoms of painful joints. Also, these two important ingredients support the natural joint function for great results in improved flexibility and mobility. Useful for both seniors and people with active lifestyles, glucosamine and chondroitin are useful to have in any joint health supplement. TwinLab Joint Fuel® Caps is a product mainly based on these two ingredients, so it can be very helpful in reducing the symptoms of ailments affecting the joints. Here is some additional info on the product you may be interested in. What does TwinLab Joint Fuel® Caps Contain? The most important ingredient in TwinLab Joint Fuel® Caps is represented by glucosamine. The amount of glucosamine per serving is quite high, which is commendable, since this is, without a doubt, the most efficient ingredient needed for treating aching joints. Chondroitin is also helpful for promoting healthy joint function, and the herbal extracts are an added bonus, since they augment the action of the other ingredients. The recommended dosage for TwinLab Joint Fuel® Caps is six capsules daily, taken in two separate doses, in the morning and the evening, with food. The price per one bottle with 120 capsules is 51.95USD. Since one serving counts as six pills, one bottle lasts for only 20 days. We saw no clear guarantee being offered on the manufacturer’s website. However, they offer contact details so you can talk to them about any issue you may encounter. It is very important to have the right ingredients included in one formula, in order for this to work. It is a good thing that TwinLab Joint Fuel® Caps contains both glucosamine and chondroitin, but we would have liked to see MSM and hyaluronic acid also included, as these are also great contributors to your joints’ health. 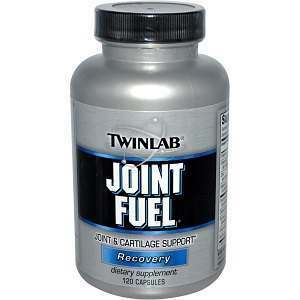 Mark Stevens	reviewed TwinLab Joint Fuel®	on October 2nd	 and gave it a rating of 2.